khoo890 From Jan until March 2019 Brent price already increase from $51 to $67 which have similar Brent chart pattern in 2017 4th Quarter Report that earn RM378 Million Net Profit (18% Net profit margin), during that quarter Brent price increase from $56 to $66, so if even put in other factor like: world economy, plant utilization, supply & demand/ASP, still this coming quarter will be very profitable. khoo890 Thats why I said BIMB Analyst been paid by fund manager to absorb your tickets. Kaliz Varan Divident announced yet? tnang how low can be?? tnang how low can be? Jiahui Foo Ghosts flying all around.....! Jiahui Foo 3.99 like supermarket offer price! Tong Coleman L 3.960 being the lowest & very unusual!!! Want to join other ECRL billionaire club flying high on Monday? Chewchear A day before KLCI was down by 15.2 points but this counter can maintain steady at 4.07, and yesterday KLCI up 5.94 points and this counter was down by 8 Cent to 3.99. Is this because of Fire & Explosion occurred in Pchem's (RAPID) Atmospheric Residue Depressurization in Pengerang Johor that cause PChem's stock price sharp dropped and the fear emotion spill over to this counter? If that blast have affected Pchem delay commissioning for at least another 6 months and defer production to next year, then this should benefited LCTitan in term of supply/demand, this should be a good news for LCTitan, but anyway yesterday some panic selling yesterday gave an opportunity to buy at 3.99 price. Looking at Brent Oil price trending and LCTitan’s expansion plan and future market growing demand, I think at RM4 was already a big discounted price and very attractive to me for near term or long term investment. Jiahui Foo Half of IPO would be perfect dream price for this. robert168 what is the ipo price? xiohai where is our finance minister ? Jiahui Foo Now is 4 down. Oil, RM, rating, share price. Tong Coleman I better look for stocks in dow jones. tnang Korean sell to Malaysian?????????????????? SamuelLuke Oil price going back on down trend, even after the opec decreases production even after Trump pressuring on Venezuela n iran..... we can almost sure oil price will not exceedingly usd80 in recent yrs already! Junichiro "Oil price going back on down trend, even after the opec decreases production even after Trump pressuring on Venezuela n iran..... we can almost sure oil price will not exceedingly usd80 in recent yrs already!" I agree. According to China's state-backed Science and Technology Daily, Chinese scientists plan to build and launch small power stations into the stratosphere between 2021 and 2025, upgrading to a megawatt-level station in 2030 and a gigawatt-level facility high above the earth before 2050. Probably oil price will remain low in the future. Like Zaki Yamani said "the stone age ended not for the want of stones n the oil age will end long before the world runs out of oil". khoo890 Industrialized economies use up to 20 times more plastic and up to 10 times more fertilizer than developing nations on a per person basis, underscoring the huge potential for global growth. The International Energy Agency expects petrochemicals to account for almost half of global oil demand growth by 2050, equivalent to almost 7 million b/d. A growing need for plastic and chemicals will continue to build global crude demand in the coming decades. Investment in downstream petroleum industries will be a more critical demand driver for oil markets in the future. shpg22 Target Price 2.90 from IPO of 6.50 from just years ago ?? Kena conned big time. shpg22 Nowadays IPO price / 2 should be the fair price. xiohai where is our finance minister ? if he doesn't care about the stock market, he should't smoke sst, n he is incompetent. staind86 Johor water level is falling again. Cheok Yong Hua Tp this couter ? Any idea ? We believe the risk-to-reward ratio is not compelling at current level. 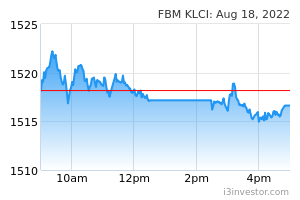 Downgrade toTRADING SELL (from BUY) with a new TP of RM2.90 (from RM7.25) which values the stock at 12x 2019F PE.